Here’s a unique and mouth-watering twist to your favorite kakanin and dessert. 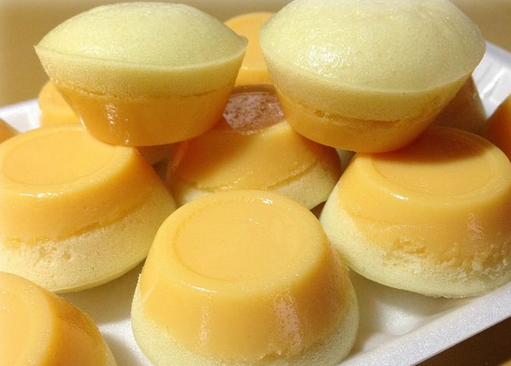 Start another home-based food business by making and selling puto flan. <>Over the recent holiday vacation, a lot of us have indulged in some of our favorite desserts. For sure, leche flan is in your personal list of most loved sweets, which you probably did enjoy during the long break. There is no doubt that home-based food businesses will still be lucrative this year. But you have to try putting interesting twists to the tried and tested recipes. How about combining leche flan with a kakanin like puto ? Sounds like a great food business idea to start the year, right? You may have probably tried puto flan products that are rarely available in the market. Those are hard to find. That is why for sure, you could get a lot of orders from your customers if you start making and selling your own puto flan. Here’s a simple recipe that will get you started. Take note that flour replaces ground rice as main ingredient for the puto component to make this recipe less tedious. 1. The flan has to be made first. The procedures for doing it are simplified. Combine egg yolks and sweetened condensed milk in a bowl. Thoroughly mix until the mixture gets an even consistency and color. Add calamansi or lemon juice and continue mixing for a few minutes. 2. Prepare the molds by putting a little grease (using oil or optionally, caramel) into each. Fill about a third of each mold with the flan mixture. 3. Steam all molds in medium heat for about 20 minutes or until the flan is cooked. Using a toothpick, you may check if it is already solidified, an indication that it is ready for the next procedure. Set the flan aside. 4. Proceed to make the puto component. Combine flour, baking powder, salt, and sugar in a bowl. Mix slowly. 5. Add water and egg whites into the dry puto mixture. Continue mixing for a few minutes. 6. Add this mixture into each mold with cooked flan. Steam all filled molds again for another 15 minutes (medium heat) or until puto has notably risen. Take all molds from the steamer and set aside to allow those to cool down. Remove each puto flan from its mold before serving in a plate or a box. Ideally, puto and flan should stick together.